Comment: I have a good and a bad new to announce. The good new is today is the birthday of Kevin Shields, the mastermind behind My Bloody Valentine, the most creative and inspiring combo having existed after the break-up of The Smiths. The sad announcement is related to Glenn Branca who died on the 13th of May (today I just got aware of the fact). Both these men showcased the noise music can be truly ennobling and truly artsy and truly fascinating. Thereafter all the guitar music would turn into history. They did not care of the opinion of other people they behaved like mad professors by following their own sonic obsessions and alchemical drives. The same can be admitted about the Yankee Adam Sigmund who had been excelling at creating a template of weird pop music. He has issued music under such labels as KomKol Autoprod, 20kbps, Proc-Records, and Sirona-Records. The recent, 4-notch issue is out of the discography of 20kbps and is an uncanny reflection upon mutant slacker pop and warped Americana and roots music. 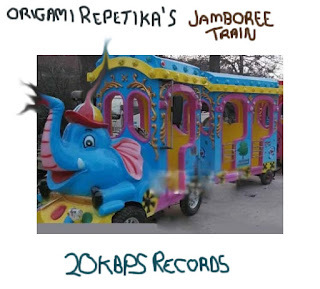 In some sense Jamboree Train can be compared to Beck's Odelay (1996) though Adam Sigmund has made even more steps forward. His fun seems to be more buried and morbid through the effect loaded compositions propelled by stomping drum programming and artsy guitar handling and evocative tuning. In a word, the result is truly impressive.